4v2 or 5v2, Y pattern passing. Red keeps possession from 2 Blue defenders. 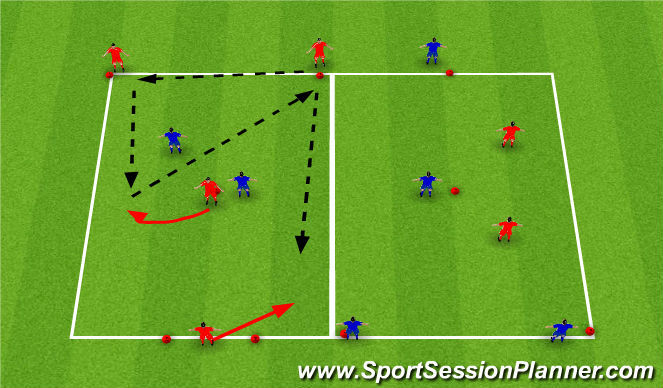 Simple progressions, with movement and realistic game situations. Focus on the ability to play through or around the opposition. Separation and quality of technique to generate speed of play. Creating good game habits, make the player understand the game, not just the drill. 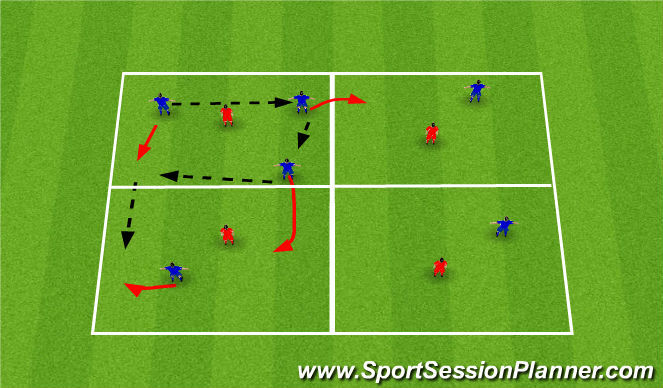 CPs: Preparation touch, playing on the move, pass to proper foot, movement to create space, supportive movements, understanding game spaces, speed of play. Ball movement with support play. This exercise should create interchange, and help the players understand the movement necessary to link together to keep possession. All players need to stay involved, and create passing opportunities. Different players should support, non-predictable. 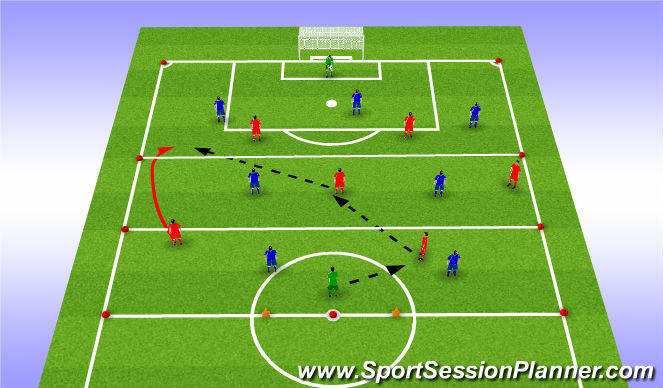 Creating overloads will help with passing options, and help players make decisions in tight spaces. Players should move to keep balance and continuously check for teams needs. Restriction: only two defending players are allowed in central zone. Creating player movement to unbalance defenders. Creating positive movement, in order to get more players in the attack, while staying balanced. Strive to have 4 players join the attack, and this can be any 4 (midfield, outsidebacks, etc). Players need to be aware of needs as well as necessary shifting to keep balance. CPs: Overlaps, support play, weakside runs, entry balls (through and around), complimenting runs away from the ball, interchange, fluidity, flow. Defensively, players need to learn how to deal with overloads, passing players on, tracking into dangerous areas, communicating and staying balanced, recognize team needs and shape.